For those of you who have always been curious about my Redesign and Home Staging Class, here’s a great example of how this training can help you ignite your creative juices, refocus and redirect your talents to jump start a new career! My 4-day seminar includes classroom study and hands-on training. For the final exam, my students stage 3 different homes that are on the market. Students evaluate, discuss and apply design theory learned in class to improve each home. 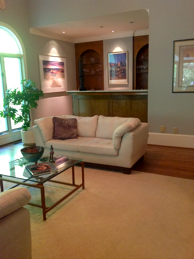 When staging a home, our first task is to depersonalize the space and identify the problem areas. 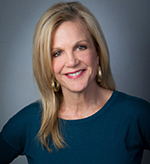 The goal is to come up with solutions to make a potential buyer fall in love with the home. This class did a phenomenal job putting all their training and practical knowledge to good use for the staging! So, where do we begin? In order to get a clean slate perspective, our first step is to completely clear the room of everything we can lift or move. We’ve already identified a space in the home to use as our “holding are” for everything we move out. All the items we cannot clear out, such as large furnishings, rugs and small plants, are moved to the perimeter of the room. Next, small accessories that we can use in the room are gathered from around the house and like items are grouped together, creating organization, easy access and quick item identification when rebuilding the room. Here, we all participate in doing some heavy lifting! We then evaluate the architecture, such as room’s shape and ceiling heights. This information is our road map to good design. We also take into consideration the natural light, electrical outlets, traffic flow options, and how rooms connect. 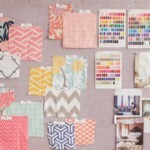 It’s also imperative to identify the main focal point of the room. Once this is established, we can start to rebuild the room with conversational grouping of the furniture. 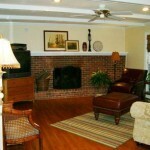 In the before photos this living room lacks balance and harmony. There is too much furniture in the room. The focal point, the fireplace, is ignored and the small accessories on the mantle look cluttered and disproportional. In the after photos, you can see that my students worked their magic, and the space was transformed. Since the homeowner’s walls were a cool gray and their furniture was modern, we decided to keep the lines clean and simple. Now there is open space, better traffic flows, and a clean and sophisticated color palette that blends well and pull the room together. 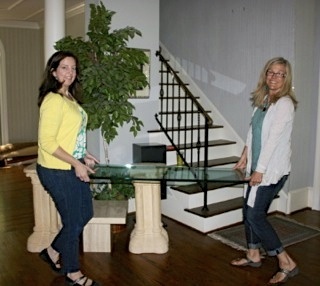 Part of the allure my class offers is learning how to re-purpose items throughout the home for a creative, new look. Accessories are reintroduced back into the room keeping color, size, height and texture in mind. 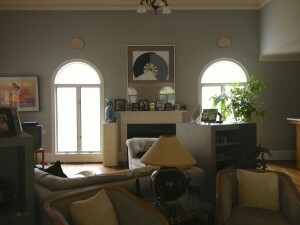 Notice how the artwork on either side of the windows adds color and symmetrical balance to the room. 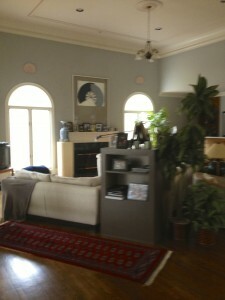 The furniture is pulled back in from the walls, and you actually have a feeling of an open and serene space. Before, the bar area was ignored and used as a display/bookcase instead of a gathering spot. We want to highlight this feature and make it engaging. The after photo almost looks like we went to a different house! Recessed lights show off strategically placed glassware. The colors in the artwork coordinate with the overall scheme. A sculptured art-piece sits on a classic marble countertop to anchor the composition. The bar now is inviting and a classic place to entertain friends. Wouldn’t you like to entertain here? 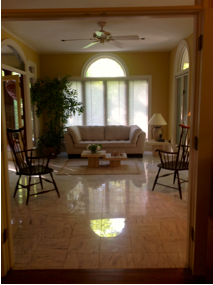 As we moved throughout the house, our next project was the sunroom. Before, the area lacked interest. All the furniture was lined up against the walls, and the space felt dull and felt uninviting. 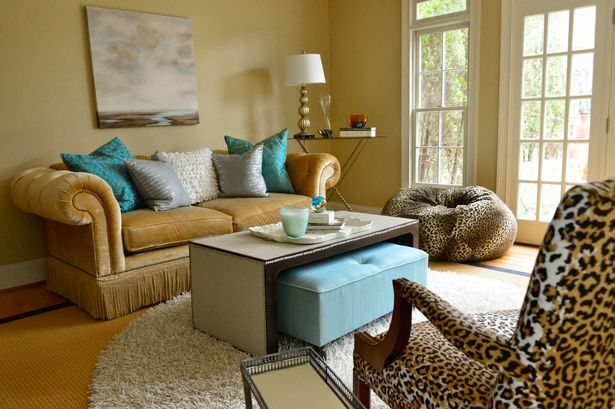 To begin, we traded out the rattan sofa with a cream one from another room, which added warmth and interest. We removed the large rug to show off the carrera marble floors, which are a real selling feature, and we added two wooden antique chairs to add a conversation triangle. 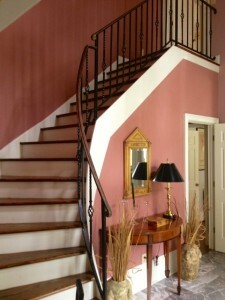 The ‘before’ foyer didn’t make a great first impression. 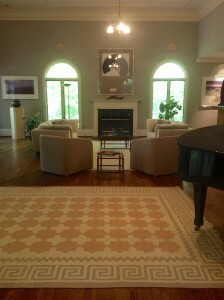 The accessories were dull and blah, making the entrance feel cold and hallow, without even a rug to absorb the sound. This feeling of ‘coldness’ can be detrimental to a sale. After all, you can only make a first impression once! 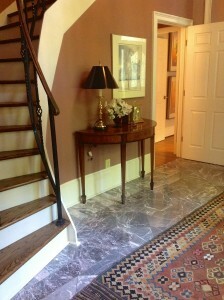 The ‘after’ foyer looks rich and elegant. 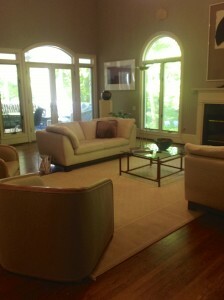 The placement of the rug and accessories “set the stage” to create ambience and class. In the end, the homeowner’s loved their new space! It made for much better photography for listings, and realtors had a flood of people interested is seeing the property. 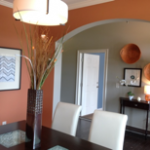 We believe the staging also added to the quick sale of the home. It was a wonderful project for us all! 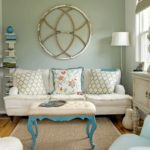 If you want to learn the secrets of staging and become a certified home stager, contact me at 404 943 077 or visit our website at www.interior-revivals.com.